As I mentioned in the story about last year's exhibition, I planned something a little bit 'different' for this show, and as you can see in this photograph - different it was! 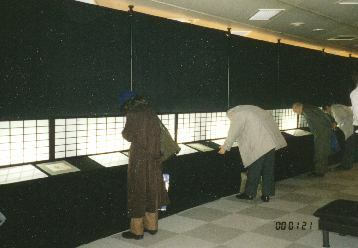 Instead of the usual brightly lit gallery with prints hanging on the walls, people were faced with this scene as they came in the door - a dark room, with a row of softly glowing shoji screens stretching away into the distance. 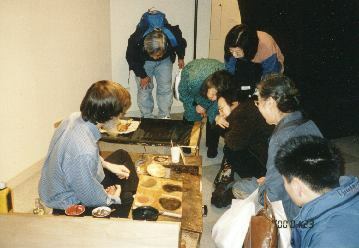 Was this a gallery ... or was it a Japanese restaurant? 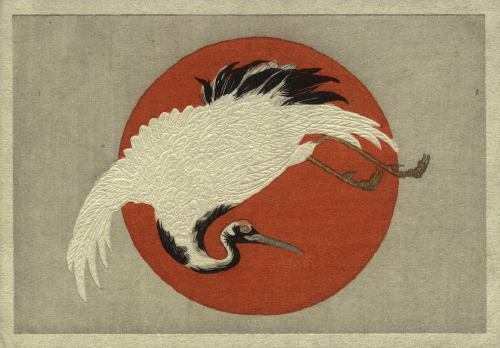 "Under what kind of lighting conditions were people back in the Edo-era able to look at woodblock prints? We have re-created it here for you ..."
"Please feel free to pick up the prints and examine them closely ..."
And this they did ... It was very gratifying to see people enjoying the close contact with the prints, and being able to see them properly, with all the soft colours and embossings visible. 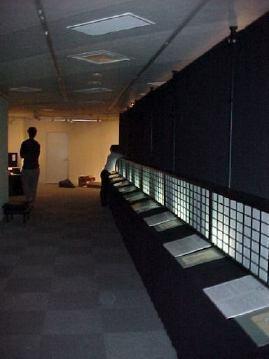 Down at the end of the row of screens, an area at the back of the room was illuminated by a couple of spotlights from the ceiling, and here I had my printing bench set up. As always, I used my most recent New Year card for the demonstrations, and this year it made a particularly effective display - the final impression is one with no colour, just embossing, and it never failed to bring a gasp from the viewers as it came up off the final block. 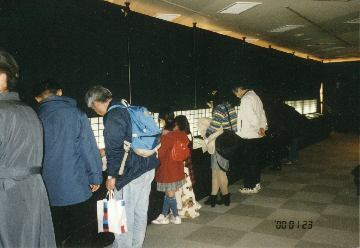 Compared to last year's rather special exhibition (at the completion of the ten-year Hyakunin Isshu project), this year's show was quieter and less exciting. But the media gave me excellent coverage, and attendance was far better than I had any right to expect. The Surimono Album was received very well, and again I was very pleased to find that a good number of the attendees wished to subscribe to the upcoming album. As usual, I refused to show the viewers the designs that I have selected for this coming album. I very much want subscribers to be surprised when each print arrives, so it's always 'no peeking'! This means though, that I have to ask them to "Trust me! I'll be making interesting prints ..."
So there was the end of another year of interesting and productive work. As I write these notes, I'm still buried in clean-up and going through the mountain of 'thank you' letters, but in another week or so it will be time to get started on the new album. After all, the gallery is already booked for next January ... Time to get busy!